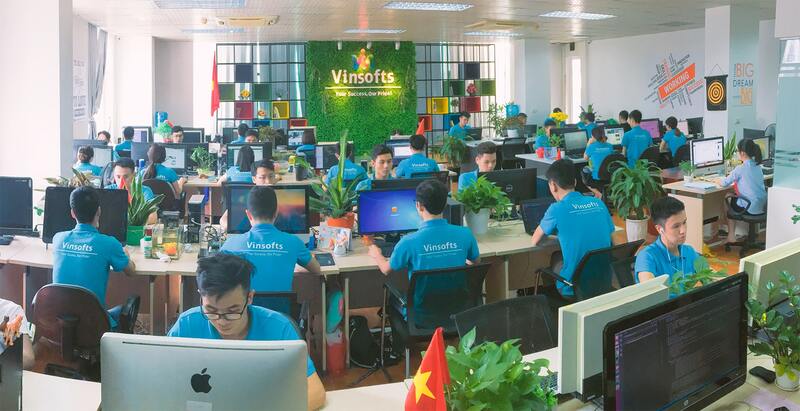 We are an audacious Vietnamese company of IT solutions and outsourcing services with 10+ years of experience, over 80 employees and presence in 2 cities – Hanoi and Ho Chi Minh. Our firm aims to increase its team of dedicated IT professionals to 200 in the next 3-5 years in order to continue growing firmly and to attain leadership within the IT industry. Vinsofts has successfully completed and handed over 500+ projects to clients from all around the world such as USA, Japan, Singapore, Australia, etc. Reliability: we take pride in always delivering our very best results, as we take our commitment with clients, partners and employees very seriously. Service to others: we follow the motto “Customer is King”, since we believe customer satisfaction is a key measure of Vinsofts’ success. Creativity: we promote an innovative corporate culture, so both our clients and services benefit from creative solutions. Courage: We are ready to take challenging projects and ideas on board, as we aim to make proposals a reality. Proactivity: Our energetic and dedicated personality allow us to bring that extra mile into every work we deliver. We are online 15 hours every day from 8:30 AM to 11:30 PM (UTC+7timezone). We are very proud of our development history. Check our corporate profile to understand more about us. The road to success has many obstacles along the way. However, we, at Vinsofts, believe that each successful project, satisfied customer and goal accomplished are milestones that remind us we are on the right track.